Reading is Fundamental (RIF) needs your help. The President's proposed fiscal year 2009 budget released in February eliminates the Inexpensive Book Distribution Program, which is the RIF Book Distribution Program. Unless Congress reinstates funding for this program, RIF will be unable to distribute 16 million books annually to the nation's youngest and most at-risk children. RIF serves 4.6 million children. Please click on the link below to visit the RIF Action Alert page so you can make your voice heard and support their efforts. Please help this worthy cause by going to the Action Alert Page on the RIF website. Well, there is a first time for everything and today I am putting together my first blog. Funnily enough, even though I have been publishing a website for several years, I find this new form of communication rather intimidating. Who would have thought it! Since this my first attempt I hope you will be patient with me. Workwise: The last days of the month approach and as always this is a stressful time because I have to get the new issue of Through The Looking Glass Book Review out. So far I have done seventy reviews and I hope to squeeze a few more out before posting day. 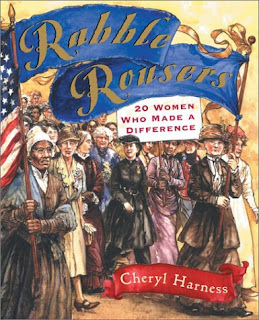 For the March issue I put together a formidable collection of books about women of note - for the Women's History Month feature. I found so many splendid stories and I hope my reviews will encourage girls to read about the brave, bright, and determined women who have helped make the world a better, and more enjoyable place. One book was great fun. 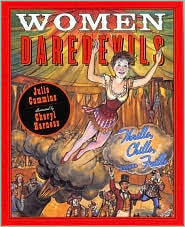 It was about the women and girls who were "Daredevils" in the late 1800's and early 1900's. They were shot from canons, rode high diving horses, walked on the wings of planes, and more. The other project this month which really delighted me was a feature on picture books which convey a meaningful message to their readers. 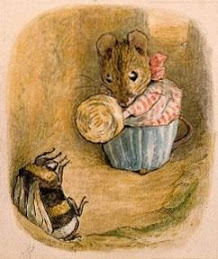 I was very careful which books I selected to review and now feel I might have to extend the feature to another month because I found so many treasures on my shelves. I want to share all of them with my readers if I can read fast enough. The topics covered by the books are varied and sometimes very thought provoking. A very exciting new development is that my new web guru (my first actually), Dune Thomas, is building a database for the website so things are going to change a lot on Looking Glass Review. I can't wait because my web building program is struggling to deal with the size of the site. The time has come for me to hand the site over to someone else to build. It feels very strange and I am still getting used to the idea. On the personal front: My family and I are going skiing on Mount Shasta, CA on Thursday. My daughter Elise has the day off from school and Brian and I have arranged things so we can take the day off from work. I can't wait. The slopes are wonderful there and I have made a lot of progress improving my parallel turns. The Holy Terrors, our two Siamese cats Suma and Sara, are wrecking havoc as usual. So far this week they have tipped over three potted plants and they broke a pretty blue glass vase that I got for Christmas. I was NOT pleased. They are also driving Reeka the dog crazy because they insist on playing with her tail. They adore our other dog Pippin and snuggle with him until he has to make a break for it. We are convinced that the cats think that they are dogs. They play with dog toys for hours and Sara is a great fetcher. 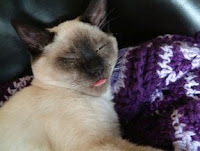 Here is Sara sleeping with her tongue sticking out. Seeing her do this makes us laugh every time. Don't be fooled by the sweet looking demeanor. She is a truly wicked little cat and yet I still adore her.